Fabric covered hoop manure storage buildings provide farmers, ranchers, and agricultural professional with a cost effective solution to storing manure and animal waste. The arched shape design of these hoop shaped building keeps the moisture from contacting the building contents. 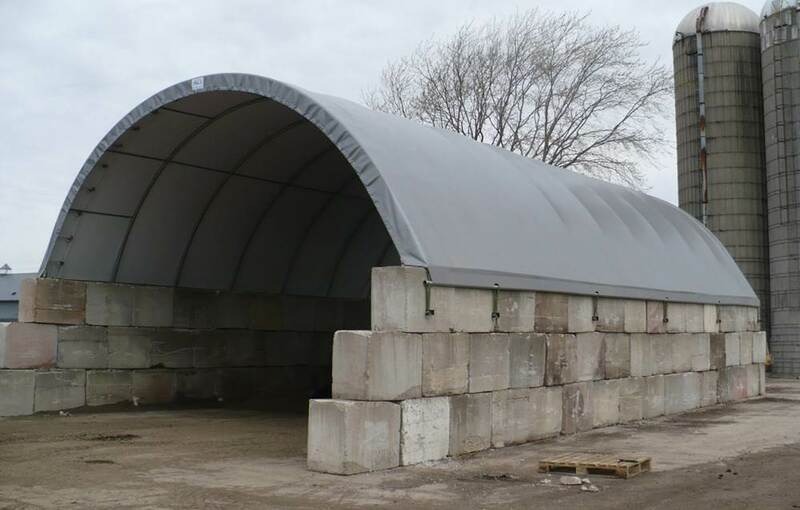 Unlike traditional wood and steel framed buildings, manure storage hoop buildings typically do not require building permits which can become costly and lengthen the lead time for construction. Flat based steel base plates with pre drilled mounting holes allow the hoop manure building to be quickly erected on poured concrete walls, block walls, and wood header walls. The rugged corrosion resistant steel framework allows the manure storage building to withstand Mother Nature’s wrath regardless of the conditions. Covers are manufactured from USA made woven coated polyethylene which is heat sealed at the seams to prevent moisture intrusion. Covers are tightly secure to the building frame utilizing a durable ratchet tension system which requires little to no maintenance. All hoop manure storage buildings include an easy to understand instruction manual which includes diagrams and photos for reference. Contact us for a custom quote on your hoop cover manure storage building.